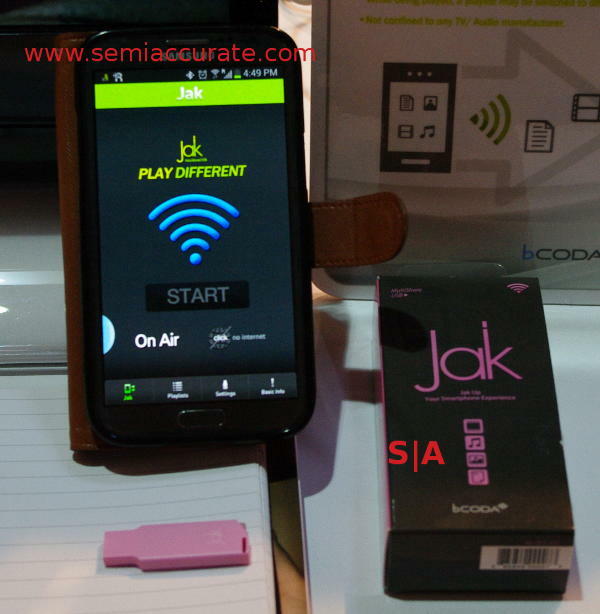 DLNA and Miracast dongles were a dime a dozen at MWC, but one of the nicest was the Jak from a little Korean company called bCoda. Their little Jak somehow manages to be both cute and amazingly light while adding useful features to the expected set. The first thing you notice about the Jak package is, well, the package. It is a simple cardboard box that punches above its weight. It slides, folds, and has compartments in ways that belie it’s roots as a folded piece of paper. In it is a bright little piece of monochrome plastic wedged into a hunk of foam, but somehow it just works. When you pick the dongle up, the first thing that hits you is how light this thing is, it is by far the lightest USB stick I have ever picked up. Everyone I have handed it to said the word cute when I asked them to describe it. The function is pretty simple to describe, it is a DLNA receiver so any Miracast capable display should work with it. You plug it in, point your DLNA server towards it, and play away. Unfortunately the S|A orbital test lab has a grand total of zero Miracast aware displays, so that wasn’t really tested thoroughly, but it did work at MWC. We were able to use it as a less automated media share, it worked without any problems on our Linux Mint 14 machines. The main thing that bCoda, or their parent company Enustech, added to the base spec is a really nicely done Android app. It is about as brain-dead easy as you could hope for, start it, press go, and it finds any Jak dongle in range. From there, you are presented with a list of video, audio, or still pictures on the Android device. So far so average, but instead of just mirroring the phone screen, Jak adds a full featured playlist capability to the mix. This may seem silly, but it is a really handy feature.